Children – innocence, openness, trust, open hearted, tenderness, beginnings. Cups – emotions, the heart, feelings, love, affections, loving. Flowers – blossoming, opening, beauty, colour, gift. 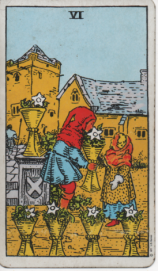 Figures – the boy is giving a flower in a cup, the girl is receiving it with open arms. Giving and receiving of emotions/feelings, the ability to share of oneself, potential for growth, openness to love and emotion. This is one of my very favourite cards in the Tarot Pack. The feeling of trust and love that emanates from it is almost palpable. Shared feelings can lead to closeness and intimacy, love can blossom and flourish in these conditions. Alternatively the blossoming potential of love, trust, sharing and intimacy can wither and die. Nothing in nature (or in the Tarot) is static, everything changes and is in constant motion. So too this blossoming love, developing in feelings of trust and openness, is in a state of continuous development. When I first started my own Email Tarot Reading Web Site, I gave myself an Egyptian Five Card Reading, asking about the potential development of the website. The outcome card of the spread was The Six of Cups. Since then, Working on the site and giving Readings to many people has brought me very close to several people and I have been blessed to develop some deep friendships as a result – I have given much and received much in return – loving and trusting, opening and sharing, intimacy and gratitude. A very beautiful process. So much in tune with the Six of Cups Tarot Card. You can order a reading from me here – you will then be able to ask me questions and share your concerns.